CarGurus has 9,201 nationwide LaCrosse listings starting at $1,295. Yeah, it’s old and staid, and some say it’s approaching Judgment Day, but Buick’s venerable LaCrosse full-size sedan still keeps on keepin' on for 2015. This 5-seat luxury-oriented family and commuter mainstay got a slight refresh inside and out for the 2014 model year, then some midyear fiddling added a few more standard extras, like LED daytime running lights. 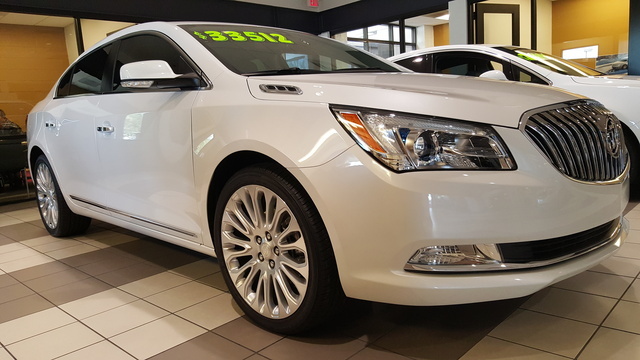 Word’s out that the 2015 LaCrosse, along with its Regal, Verano and Encore country cousins, is in line to get GM’s brand-new 4G LTE capability shoehorned into the popular OnStar Directions and Connections system. This upgrade allows access to Buick AppShop technology, as well as WiFi connectivity. But (and there’s always a “but”) the data package needed to activate all this new techno-wizardry will cost extra. Additionally, a couple of new exterior color choices and a tweak or three to interior materials are also on tap for this upcoming model year, as are rumors of some shuffling in the trim lineup. As it stands now, however, this classy conveyance comes in 4 trims, known as groups in Buick-ese. Said trims include the basic Base LaCrosse, the Leather Group, the posh-leaning Premium I Group and the top-shelf Premium II Group. All are delivered with standard front-wheel drive (FWD), while the Leather and Premium I Groups can both be equipped with an available full-time all-wheel drivetrain (AWD) for those snowy trips to the office or the theatre. Buick has a rather unique drivetrain arrangement for its LaCrosse Base and the FWD Leather Group, in which each sports a standard 2.0-liter inline 4-cylinder (I4) engine with Buick’s touted eAssist technology. Said eAssist technology is Buick’s way of describing what is, at bottom, a hybrid system that flaunts an 11-kilowatt electric motor and lithium-ion battery pack. This unheralded hybrid power source mates with a 6-speed shiftable automatic transmission for a total (gas and electric) output of 182 hp and 172 lb-ft of torque. Mileage in each hybrid-I4-powered LaCrosse trim is expected to remain 25 mpg city/36 highway, which isn’t bad for a hefty sized 4-door. Need some added oomph? Look for the AWD Leather Group and both Premium Groups to again boast a standard 3.6-liter Flex Fuel V6 powerplant that returns to team up with the 6-speed shiftable automatic for 303 hp and 264 lb-ft of torque. Mileage estimates for the FWD versions remain 18/28, with AWD editions again boasting 17/26. Complementing the anticipated 4G LTE techno-bling expected for the 2015 LaCrosse stable are such returning trim-specific adornments as 17-, 19- or 20-inch alloy wheels, heated power-adjustable mirrors, leatherette or genuine leather upholstery, heated power-adjustable front seats, memory for driver's settings and full power accessories. Cruise control, telescoping tilt-wheel steering, a remote garage door opener, and the aforementioned 4G-upgraded OnStar technology should adorn all 2015 LaCrosse variants, as should rear parking sensors in higher trims. For 2015, Buick has announced that the rear-view camera, once standard only in the higher trims, is henceforth to be standard equipment throughout the lineup. Finally, all groups/trims also retain driver's memory settings, dual-zone climate control, an auto-dimming rear-view mirror and an AM/FM radio with either 6 speakers in the lower trims or 11 Bose premium speakers in higher trims. Options, barring any significant changes for 2015, include the Ultra Luxury Interior Package (all groups except the Base), which boasts upgraded leather upholstery and added leather inserts as well as a simulated suede headliner and genuine wood cabin accents. This snazzy package can be complemented in all trims by an available power sunroof, and/or available rear-seat DVD entertainment that now flaunts re-positioned screens for 2015, thereby alleviating the potential for motion sickness in second- and third-row movie watchers. Oh, by the way, cargo area remains 12.8 cubic feet in the V6 LaCrosse groups, with the hybrid I4 trims offering only 10.8 cubic feet of trunk space due to the battery pack taking up a couple of cubic feet of room. Finally, standard safety features will again include 4-wheel antilock brakes (ABS), traction and stability control, front side-mounted airbags, and front and rear head airbags. Look for all this mandated equipment to be bolstered by standard LED daytime running lights, a post-collision safety system and a remote antitheft alarm, lineup-wide. For the Leather Group and above, turn-signal-integrated mirrors are standard, while a pair of available Driver Confidence packages flaunt, depending on the package chosen, blind-spot alerts, rear cross-traffic alerts, adaptive cruise control, and forward-collision and lane-departure warnings. 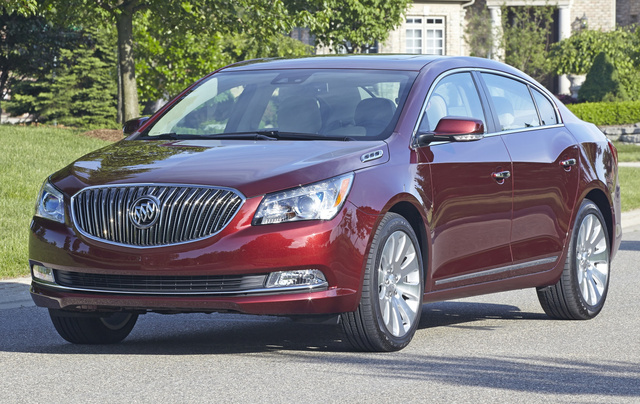 What's your take on the 2015 Buick LaCrosse? joe97478 If a car review doesn't touch on 0-60, quarter mile time and speed, or gas mileage, or miles on a full tank of gas, I sort of find it useless. Have you driven a 2015 Buick LaCrosse? I have a 2015 Buick Lacrosse. The trunk button inside the car opens the trunk as it should. The key fob button will not open the trunk. Problem and solution??? My 2015 Buick Lacrosse will randomly give me a ding ding noise. There are no accompanying warning lights. 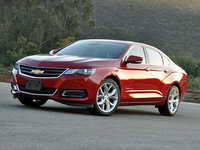 What Is The Difference In Impala Premier And LTZ 2, XLT Trim? what is it when you turn on you air condition and it give out a bad smell. Can One Search For All LaCrosses In Midnight Amethyst?